What’s the biggest screw up in the kitchen that you were responsible for? Not many myself in all honesty. I faithfully follow recipes so normally things turn out quite well for me. My own biggest mistake I confessed in a post I published a while ago. But my friends and flatmates have been involved in some memorable mistakes. Did I ever tell you about the day my friends on the catering team went out and bought ingredients needed for feeding four hundred volunteers working on a project? That day they were going to make Paprika Chicken and a vegetarian option for around thirty of us who were vegetarians. Well, they bought the spices in bulk from a wholesaler. Only someone made a mistake somewhere along the line (I don’t think we will ever know exactly who) and the tub that had been labelled “PAPRIKA” turned out to be chilli powder. The discovery that all of the chicken had been smothered with chilli powder was made so late in the course of the meal preparation, that they had to concoct a desperate plan to rescue lunch. The solution? Enormous quantities of orange juice. Apparently, that was the way to tone down the chilli powder. So lunch became Orange and Chilli Chicken, which, I could see from the faces of everyone sitting around me tucking into it, was a quite strange concept to most of the Welsh volunteers on that project. There was an evening when Ella had been mixing her batter for a cake. She opened the oven door and somehow managed to throw the contents of the cake tin all over the oven, stove, worktop, it started dripping down over the cupboards and drawers below. I helped her clear it up and Ella would not allow any of the make occupants of our flat into he kitchen until all evidence of the mishap had vanished. Ella and I were laughing the whole time we were cleaning up. Another time I was part of a catering team on a project in Bristol. They had a very well-equipped kitchen with brand new everything, including brand new knives. Every single one of us cut ourselves within the first half-hour. There were so many blue plasters on our hands and digits that day. The more I think about, it the more stories are popping into my head. I have worked on a lot of catering teams and I can remember some hilarious mistakes being made. I will have to include them in other posts. What, in your opinion, makes people believe absurd conspiracy theories? Sometimes, he would be more specific. 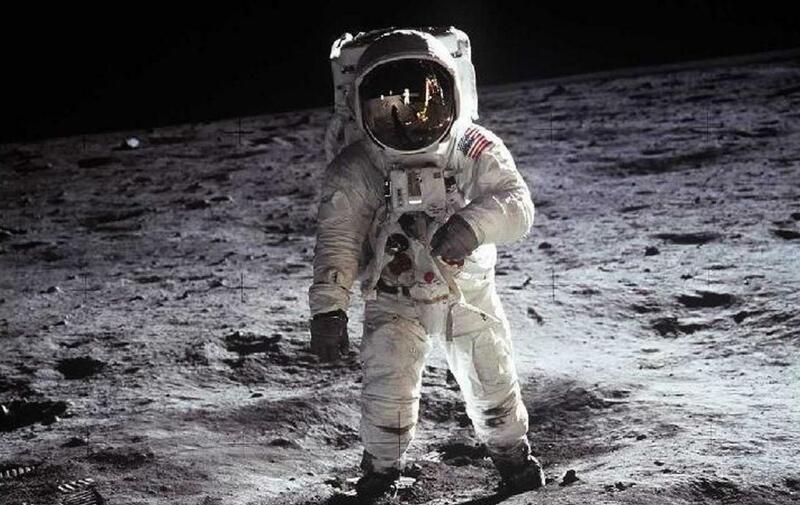 He claimed man had never walked on the moon, that it was all a hoax. He claimed man has never been in “outer space” at all. He insisted the earth is flat and not a sphere or globe. He said that aliens are ruling the planet and stripping the planet of all it’s resources. He also claimed brain surgery is a hoax. He does not believe it possible that people can actually have their brains operated on. One day he was speaking to me very intensely and seriously about “the big conspiracy” we are all being duped by. He referred to the beast, the wild beast and he said it’s all happening just as the prophets said. Then he told me what had helped him to to recognise “the big conspiracy” was how little things are changing all around us all the time. The changes are so imperceptible that most people will not notice. He said that the spelling of Febreze had changed. He said it should be Febreeze, but they had dropped a letter hoping nobody would notice. He also said that there have been mysterious changes to KitKats, and it is all part of “the big conspiracy”. Now, I was not going to take issue with any of the things he said. I asked him what he thinks the future holds. He said the end of the planet, which the aliens will cause once they have stripped the planet of all valuable resources. I was distressed by his state of mind and in a way how vulnerable he was. But I could tell he liked me and he was trying to enlighten me by sharing all his ideas with me. All I could do was offer him encouragement to continue attending his appointments and make healthy habits a part of his life. With regards to beliefs. I think some approach information in a very cautious manner, with a streak of scepticism. I think it is right to test out information and ask who is saying this? What is their motive? What evidence do they have to support their claim? Is that evidence authentic and trustworthy? I think there are some clever people who can come over as very convincing and genuine, but often they are very misguided or have their own questionable or even sinister motives. However, that doesn’t mean you should suspect everyone is out to con you. You have to be able to trust to be able to function. Don’t be paranoid about everyone or everything. Some people accept information more readily because it is what they want to believe. They might overlook shaky evidence as they are happy with the conclusion and disregard any holes in the evidence. I do think a lot of us are far more easily influenced than we may ever imagine we are. The power of advertising and the media is phenomenal. Many are so eager to obtain a body shape or a fitness level, they try every new diet, every new vitamin, every new exercise regime. I think for the most part, living a balanced way of life and avoiding extremes or harmful habits works well. But if people want to go along with the latest information on diets and health regimes, I guess that is not necessarily harmful, so long as they don’t go to extremes that would damage their health in the long run. Some of the mis-information out there is not too harmful in itself. But I do think there is false information, whether it be conspiracies or propaganda that is very harmful. Hmm. Well…I am not sure. When I was a lass, we were allowed to play outside for hours with our friends. We would roam across quite a wide area. There was a huge county park not far from where we lived. A group of us children would wander over there and climb trees or play “hide and seek”. 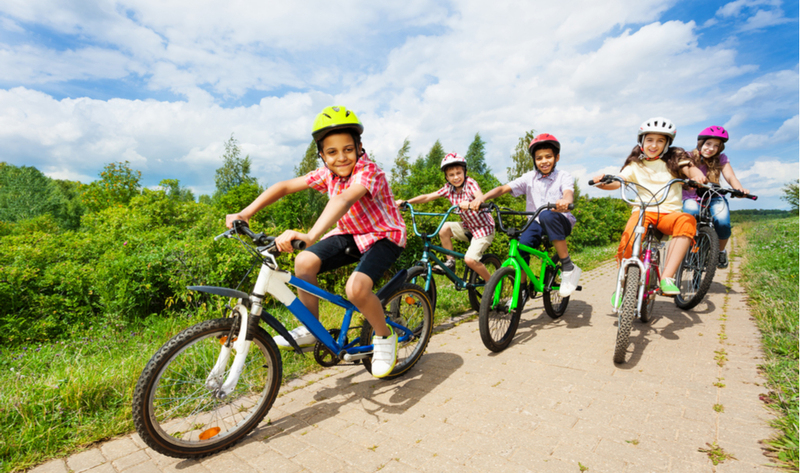 We would ride our bikes for miles. If I was a parent nowadays, I would not feel happy at all to allow a child that freedom. Especially not after becoming the victim of serious crime myself. I can only imagine that while some humans continue to feed their own minds on harmful material, we are only going to have to be more aware of our personal safety, not less. So in 40 years time, will people look back and wish that we lived in a more innocent era, when you did not have to think so much about who might be out there waiting for an opportunity to carry out some heinous act? Ooooh – I am too scared to be overly forthright about this. Isn’t it a bit pedantic to start defining and departmentalising what we have for lunch? 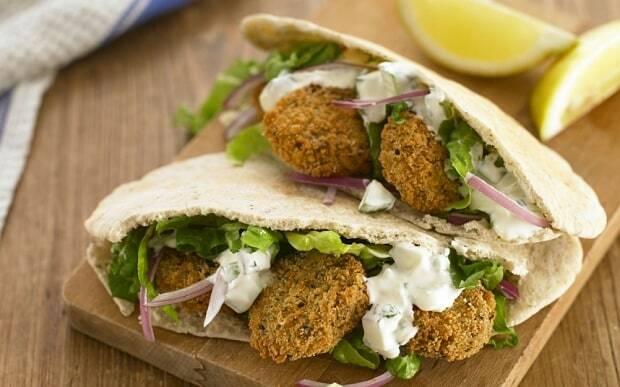 Is a pitta bread stuffed with falafel and salad a sandwich? What about a tortilla wrap stuffed with veggies and salad? Is that a sandwich? I know not, nor do I care. I prefer them to a cheese and pickle in between two square slices of bread sandwich. But, I guess in my mind they are more sandwich alternatives than sandwiches. I have not had a hot-dog in thirty years, but I guess I would include that as a sandwich alternative. Something that might have similarities (bread…filling etc) but is rather more than we would expect if we were told it is sandwiches for lunch today. What wonderful thing happened to you this week that you’d like to share? It can be a gratitude moment or something that just made you feel very happy at the time or made you laugh. There was one day this past week which was very hectic. I slept through my alarm and so did not have time for breakfast before I left the little nest. I went to an appointment, and although I arrived on time, they were running late, I had to rush to be at work on time and didn’t have time to pick up some lunch. Normally I am more organized but I had only arrived home the night before after midnight, so I had not prepared anything in advance. Around 3.30pm hunger started to kick in. I was finishing my shift that night at 8pm. I was convinced I needed food but I was on my own at work. 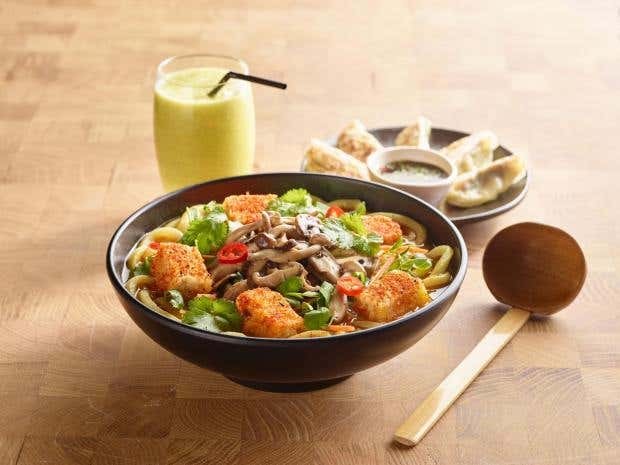 There is nowhere nearby where I could run in and grab a sandwich, but there are restaurants that I thought would do take-away like “Wagamamas”. So I called Wagamamas and ordered a vegan option and I mentioned to the lady on the phone, that I would have to run over and grab it quickly as I was on my own at work. Well, fifteen minutes later, I was getting ready to do exactly that when she appeared with my food. She told me she thought it might help me. Oh it did, it really did! She was so kind and thoughtful to do that. Thank you lovely Wagamamas lady – whoever you are. You made my day. And the food was delicious! Thank you Melanie. I do enjoy your questions. I love seeing how other bloggers answer the questions too. The Wagamama lady was so sweet. I think there are some lovely folks around. Almost every week we have customers who bring us biscuits and chocolates (we received even more when I worked in healthcare. I know sometimes the world is so harsh and hostile…but there are so many sweet hearted people who brighten each day.